Imagine a place, where landscapes are crafted from pure imagination, that lays under a blanket of dark skies and starry sights, a world of tangled trees and twisty trails awaiting exploration, an island of adventure waiting to be explored. Start your Isle of Man story the right way, as soon as you’re on board, with a choice of lounges, café and bar, there’s even two cinema rooms on board Manannan. You’ll really be able to unwind as we sail you to the heart of the island’s capital, Douglas. Once you’ve arrived, simply drive off and begin your adventure. Speaking of adventures, there is lots to see and experience from sheer cliffs, rises and falls, tons of history, sea creatures basking in the shallows. Discover secret coves and caves that smugglers once made use of, a land of giants, tall tales and no tails, enchanted forests where fairies take flight and a bridge that brings you luck. The Island isn't just long walks against backdrops crafted by pure imagination or lazy days on hidden beaches. The Isle of Man is known as a great place to kayak or surf amongst other things, you can try them all and more. The more adventurous visitor won’t be disappointed either, with rock climbing, caving and coasteering available. The island has a broad appeal for intrepid explorers and adventurers of all ages and you’re never too far from the sea! For those who prefer to be on dry land, the 95-mile Raad ny Foillan is a rugged footpath that hugs the island’s coast or why not explore one of the 17 National Glens. There is also plenty of fun to be had in the forestry plantations, some of which have been turned into adventure playgrounds with mountain bike trails, Segway tours and tree-top rope courses. 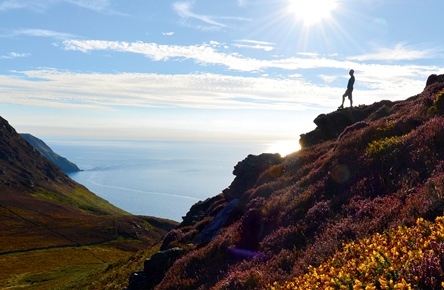 From long holidays, short stays to weekend breaks, you won’t be disappointed in the Isle of Man. Enjoy delicious local cuisine, and recharge your batteries with a restful night’s sleep with some of the finest landscapes in the British Isles. With no luggage fees, you can pack more in to your holiday or weekend break, take everything you’ll need and bring back any goodies you pick up at no extra cost. Where will your story take you? To help you plan your trip, visitisleofman.com have put together a number of sample itineraries based on various themes and lengths of stay, which you may find useful. When you sail with us, you can take your vehicle on board. Simply drive off the ferry and enjoy the freedom to explore 10,000 years of the Island’s heritage and culture at your leisure. We have some great offers available including our very popular car offers.